Invert colour of selected text? Hello, is it possible to have the colour of selected text be inverted, so that I can use a dark colour for text selection without losing legibility (like the block caret does, for instance)? 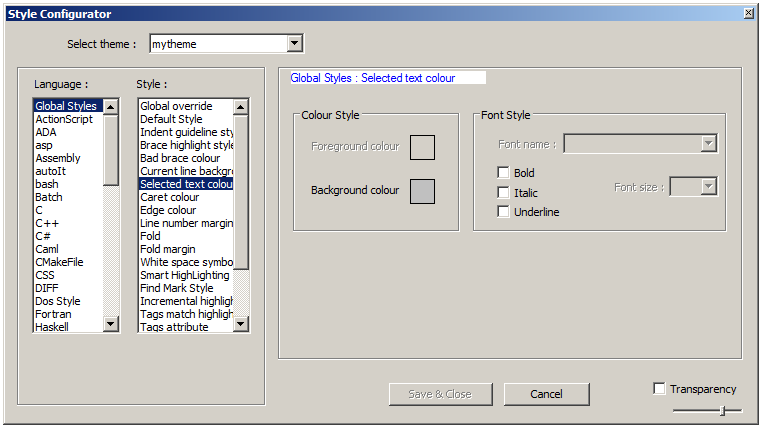 Select the theme, then the Language you want to edit, then edit away in the Style. Thanks for the reply, but the only place that I can see where you can edit the colour of selected text is in the “Global Styles” section, and the “Foreground colour” for “Selected text colour” is greyed out: https://i.gyazo.com/ccc1ecd1bbfd78027b5b371b0f44f10b.png I have also tried manually editing my theme’s xml file, but this doesn’t do anything either. decoderman is right, this is the place to modify your styles. It might be that your “mystyle” doesn’t expose all available/needed attributes. Compare it with existing themes or the standard/default stylers.xml. I haven’t seen any style thus far that successfully adjusts the foreground colour of selected text, so I wonder if this is even possible. You are correct, I have checked the code and it only reads background value. Oh well, that’s a shame. Thank you for confirming, though. the foreground color by using python script and plugin. or as a general default foreground color. The disadvantage about it is that changing the style back to default or any other theme cannot be easily handled. this could be a possible solution. Interesting, thanks, I will have a read of that link!